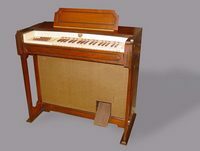 The Optigan (= OPTIcal orGAN) is a late descendant of the light-sound instruments. A rotating twelve-inch plastic disk encoded with 57 concentric soundtracks for melody and accompanying instruments is read by a photoelectric cell. The left hand uses buttons to select one of seven different chords (major, minor or diminished) or a variety of percussion or sound effects, while the right hand can play a melody on the three-octave keyboard. A large number of arrangements were available on disk.